Tatra mountains are located in southern Poland, right on the border with Slovakia. They are the highest and most spectacular Polish mountain range. If you want to get to know the natural beauty of Poland, Tatra mountains are a great choice (generally, Poland is good if you're looking for the cheapest places to travel in Europe). The highest mountain in Poland is Rysy - it reaches 2499 metres. But it is the Slovaks who have the highest part - mount Gerlach in Slovakia reaches 2653 metres. Anyway, hiking in Poland is an awesome adventure and what I especially like about Tatra mountains is the great diversity of trails. There are easy few hour hikes, long whole day routes, and difficult trails requiring some climbing skills - Tatra mountains are perfect for all kinds of outdoor lovers. Let's have a look at the best places to visit in Tatra mountains. Giewont mountain belongs to Western Tatra mountains. It actually consists of 3 peaks, the highest of which reaches 1895 metres. It is the most characteristic mountain massif in Polish Tatras. Its peculiar shape resembles a lying person and Giewont is also called The Sleeping Knight. Giewont is also known for the 15-metre high steel cross, which makes it a popular destination among pilgrims. What is worth to mention here is that the cross makes Giewont even more dangerous during thunderstorms - the cross is a magnet for lightning and the mountain is the most prominent peak in the area. We definitely do not want to be on Giewont during a thunderstorm. The hike to Giewont takes about 8 hours. The above route has sections which are closed in winter. The first part of the hike leads on the blue trail. It is a forest path, very easy to hike, but no views no far. After about 1.5 hour hike from Kuznice, we get to Kondratowa Valley mountain hut. It is the smallest hut in Tatra mountains, so it is highly possible we will not find any sitting space in the shelter, but there are some outdoor benches. We continue hiking on the blue trail. In the beginning, the trail is still very easy, but it gradually gets steeper. After around 1 hour we get to Kondracka Pass (1725 metres). It is a nice place to take a break and gather strength before we climb Giewont. We continue our ascend on the blue trail. In 10 minutes we are almost at Giewont top. But there is one more challenge. We climb on the right side of the peak. There are chains to facilitate the hike. It is the final part with chains where traffic jams are so frequent. When we get to Giewont mountain top we still have to be cautious - on the north side there is several hundred deep chasm. Hiking from Zakopane Kuznice to Giewont takes about 3 hours (breaks included). After we absorb the spectacular panorama from Giewont top, we start climbing down on the blue trail (right side of the mountain). There are chains to make the descent easier. The red trail is a very interesting option - there are 2 viewpoints on the way. Anyway, it is better to explore unknown trail rather than get back on the same route 😉. Hint: Giewont peak is immensely popular in summertime. There are traffic jams nearby the peak which make the climb dangerous. The best time to hike to Giewont is September. The weather is more stable, there is a smaller risk of thunderstorms and there are fewer tourists on the trail. During one of our trips to Tatra mountains we did really good hiking – we walked about 30 kilometres! It was a challenging experience, but totally worth it - a fantastic landscape of Tatra National Park rewards every effort. We hiked to Morskie Oko lake but chose different trail than the majority of tourists. The red trail from Palenica Białczańska car park (Morskie Oko parking) is one of the most popular Tatra National Park trails. So, we decided to hike another trail. This is definitely not the fastest way to get to Morskie Oko, but the advantage of this hike is very little tourists on the trail. We start our hike from Toporowa Cyrhla district and follow the red trail. It is a nice and easy forest path. After about 1.5 hours we get to Psia Trawka trail fork. It is a great place to take a short break - not many tourists, benches, peace and quiet. Then we follow the red trail. The path leads through forests and meadows. On our way we pass Rówień Waksmundzka (1405 metres) - picturesque mountain clearing, perfect to have a picnic or just lie on the blanket and stare into the sky. After about 1 hour we get to Wodogrzmoty Mickiewicza waterfall. Here the trail merges with the popular road leading to Morskie Oko lake – the biggest and the most beautiful Tatra lake located on 1395 metres. This is my least favorite trail in Tatra National Park. Morskie Oko is an amazing place, but it tends to get crowded - there are a few trails leading to the lake and it is easily accessible to all tourists (also those who do not like hiking). Since Morskie Oko lake is so famous, there are always crowds of people and carriages pulled by exhausted horses. I truly dislike this asphalt road and wonder why we chose to go there - it is not very comfortable for me to hike on 'artificial' paths. I am all for dirt trails. Besides, there have been cases when a poor horse died while pulling the carriage because of heat and effort. So, here is what I think: if a person has legs and can walk, but does not like hiking, there are plenty of beaches for him/her to lie on. Fortunately, on the way to Morskie Oko there are steep forest shortcuts which make the hike a bit shorter. They are less crowded and more demanding - perfect to diversify the hike. OK, let's get back to our hike. When we get to Morskie Oko lake we are already rather tired as our hike already lasts over 5 hours. We need to keep in mind there might be no table available in Morskie Oko mountain hut, so we can have a quick snack on a rock close to the lake and go back hiking the same trail. The views on Morskie Oko are truly breathtaking - this vast postglacial lake is surrounded by majestic peaks of High Tatras, which makes us appreciate the wonders Mother Nature gives us. 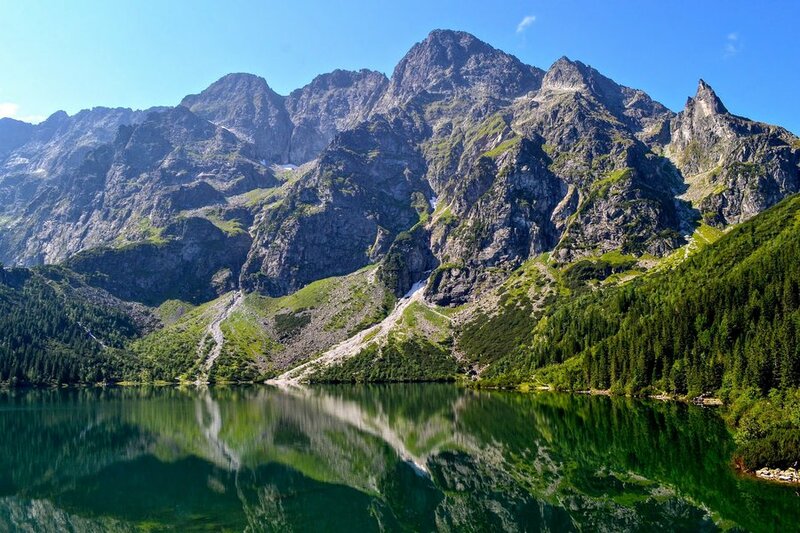 But, unfortunately, it is not easy to contemplate the nature while being in the middle of a noisy crowd, so it is best to hike to Morskie Oko lake early in the morning to avoid crowds. Even in low season. Five Lakes Valley is considered to be the most scenic valley in Tatra mountains. In the summertime, it is also an easy and enjoyable hike suitable for families with children. For me, it is one of the best hikes in Poland. We leave the car at the parking lot in Palenica Białczańska (984 metres). It is commonly known as Morskie Oko parking. It is a very popular car park, so it is best to arrive early in the morning. Getting to Five Lake Valley takes about 2 hours. In the beginning, we hike the red trail. It is nothing special, just an asphalt road. When we get to Wodogrzmoty Mickiewicza waterfall we take the green trail leading to Five Lakes Valley mountain hut on 1672 metres. After 1 hour we get to trail fork and can choose the green or black trail. Let's hike on the black trail, as we will get down on the green path. But most importantly, the shelter is located over Przedni Staw Polski lake - such an awe-inspiring view! I highly recommend hiking to Five Lakes Valley - it is relatively easy to get to and sooo beautiful! And the mountain hut there is not that crowded - no cable car or asphalt road and relatively high altitude make this place more adequate to relax in peace and admire stunning views. When we leave the mountain hut, we keep hiking the blue trail. We need to remember that Zawrat Pass is situated deep in High Tatra mountains and climate is rather harsh. We hiked there in the middle of June and it was cold, windy and there was a lot of snow on the trail, while in the valley it was already summertime. Weather in Tatras can be very surprising. Nice and short, one of the easiest Tatra National Park trails - Nosal peak reaches only 1206 metres. Nevertheless, it is an interesting trail - it leads to a surprisingly high mount taking into consideration Zakopane proximity. We start hiking in Zakopane Jaszczurowka along the green trail. After 30 minutes we get to Olczyska Clearing on 1048 metres. It is a nice place to take a break and relax. Then, we head towards Nosal peak along the yellow trail. In 20 minutes we change into a green trail. 10 minutes more and we are on Nosal mountain top admiring Zakopane and Western Tatras panorama. We end our hike in Zakopane Kuznice. There is a cable car which goes to Kasprowy Wierch mountain. The whole hike takes only about 1.5 hours. Nosal mountain may seem insignificant on the map, but it offers excellent views from the top. Red Peaks trail is not technically difficult. There are no exposure points or chains. At some points the trail gets steep, but the effort is rewarded with the spectacular landscape of Western and High Tatra mountains. I hiked Red Peaks solo at the end of September 2018. I was expecting colorful autumn but had to hike in deep snow. Still, I consider it the most rewarding mountain trail I have ever hiked. However, this route is rather long - it took me over 8 hours to hike it. The trailhead is in Kiry village. There are several parking lots nearby. We start our hike in Koscieliska valley on the green trail. After about 20 minutes of walk, we get to trail fork and start hiking on the red trail. The first part of the red trail leads in a forest, but it soon changes into meadows and we get to admire beautiful views of Western Tatra mountains. The trail gets slightly steep at some points, but there are nice places to take a break. The first mountain we get to is Ciemniak. Hike to Ciemniak from Koscieliska Valley takes about 3.5 hours. On a sunny day, the landscape takes your breath away! After we absorb the immense mountain beauty we continue our hike on the red trail. In 10 minutes we get to Krzesanica mountain. The path leads us on a picturesque ridge. It is nice, wide and safe, no climbing skills are needed. Next mountain top we climb is Malolaczniak. I decided to hike all four of Red Peaks and walked to Kopa Kondracka. Each minute spent in the mountains on a sunny day is priceless 💛. When we get to Kondracka Pass (1725 metres) it is time to hike down on yellow trail. The path leads towards Giewont mountain. After 40 minutes we get to Kondracka Pass (1725m) where we can take a break. Then, we climb down in the forest to Wielka Polana trail fork where we change into the black trail. The black trail leads towards Przyslop Mietusi (1193m). There is a viewpoint, which is great, but the trail also ascends slightly, which is quite tiring after a whole day hike. There are benches on Przyslop Mietusi viewpoint - great place to take a break and admire the last beautiful landscape on our way back. I chose the first option because I prefer to climb down a different trail than the one I used to climb up. Hint: there is no mountain hut on this route, so it is necessary to take plenty of water and snacks. The earlier we start the hike, the better. This mountain belongs to High Tatra range and is considered to be one of the most beautiful mountains in Tatra National Park. Its characteristic pointed shape resembles Matterhorn. I think it is one of the best hiking trails in High Tatras 💛. However, this trail is suitable for a bit more experienced hikers, which I will explain below. Koscielec peak reaches 2155 metres and the panorama from the top will make your hiking in Tatra mountains a truly memorable experience. The best way to hike to Koscielec is to start in Kuznice Zakopane. Getting to the top takes about 3.5 hours. We start hiking on the yellow trail. The path leads us through a forest. In 1.5 hours we get to the trail fork where we choose the blue trail. We hike on a nice trail leading us through Tatra meadows. After 20 minutes we arrive in the mountain hostel. The advantage of this route is that we pass Murowaniec mountain hostel on our way. It is a perfect place to take a break and relax before the bigger challenge in High Tatras. After we pass Murowaniec hut, we hike on the blue trail in Gasienicowa valley. Gasienicowa valley is a picturesque place in the Polish Tatra mountains. Even if we do not want to hike to Koscielec, it is definitely worth to visit Gasienicowa valley - the majestic High Tatra peaks which surround the valley are breathtaking! After about half an hour of a hike from Murowaniec hostel, we get to Czarny Staw Gasienicowy Lake. We take a few fantastic photos and turn right from the lake - start hiking on the black trail. The first part of the black trail which leads to Karb Pass (1853 metres) is steep, but still technically easy and even inexperienced hikers can walk there. After we get to Karb Pass the hike gets more difficult. There are 3 places which might create some problems for travelers who have never hiked in rocky mountains. The trail leads on big rocky blocks which require some climbing. There are no chains or any other artificial facilitations on the trail. This hike is even more difficult when it is raining. Koscielec trail is fine to hike only on sunny days when the rocks are dry and easier to hike on. After we get to Koscielec peak our efforts are rewarded with a great view and a feeling of satisfaction that we made it to the top 😀. We climb down on the same trail to Karb Pass. The descent is more difficult and a lot of caution is needed. When we get to Karb Pass we have a choice: we can get back on the same route or hike towards Zielony Staw Gasienicowy Lake (blue trail). The second option is slightly longer, but more interesting - we get to explore a new trail with a new lake on the way. Nice and pleasant option. Also, there are fewer tourists near Zielony Staw Gasienicowy. Czarny Staw Gasienicowy tends to be very popular, especially during summertime. The main tourist resort in Polish Tatra mountains is Zakopane. It is an extremely popular tourist destination in Poland - this town has 33 thousand residents and about 3 million visitors each year! As it can get very crowded, we usually stay in the quietest area we could find there – Toporowa Cyrhla district. It is located on 1000 metres, away from town's hustle and bustle. Also, the landscape in Toporowa Cyrhla is definitely nicer than in Zakopane centre. We stayed at Toporowa Cyrhla Apartments and liked it a lot! The apartments are nice and clean, the kitchen is well-equipped, but most importantly, this accommodation is located close to hiking trails. If you are looking for peace and quiet, this one would be just for you. If you prefer to stay closer to Zakopane centre, and you are looking for a comfortable hotel with SPA facilities, then Aries Hotel Zakopane might be just for you. The breakfast is abundant and delicious, suitable also for vegans or lactose sensitives. It is easy to find, in the vicinity of the main street, parking facility is near to the hotel. The whole building is made of wood, very stylish. If you are looking for a budget-friendly place to stay in Zakopane, there is an affordable hostel in the center - Top Hostel Zakopane. It is located on Krupowki street, so it is perfect for travelers who want to enjoy all the Zakopane attractions. Breakfast is included. During our trips we often visit Bukovina water park in Bukowina Tatrzanska. We really like outdoor hot geothermal pools, slides and, of course, brilliant views of Tatras visible from the pools. Perfect option after a day spent hiking in the mountains. And the entrance fee is rather cheap compared to other water parks in Zakopane. Bukowina Tatrzanska is a lovely and picturesque mountain village just a few kilometres from Zakopane. Staying in Bukowina Tatrzanska village has its advantages - Zakopane gets very crowded in the summertime and Bukowina Tatrzanska is much quieter. Also, the prices are a bit lower. Getting to Zakopane from other cities in Poland is easy. There are trains and private buses going to Zakopane all year round. One of the most popular bus shuttles is PolskiBus. Getting around in Zakopane is a bit more tricky. There are private tourist buses going to trailheads from Zakopane center. The central bus station is near the train station on Tadeusza Kościuszki 25 street. Buses shuttle very often, so there is no strict timetable. Tickets are sold only by the bus driver, they are not available anywhere else. Buses do not have any particular numbers. Their destination is visible at the front window of the bus. The most convenient and fastest way to get around in Zakopane is a car. We love Tatra mountains and hope to visit this amazing Polish mountain range every year! 💚 Those mountains are the biggest Polish natural heritage and we are lucky to have such a remarkable region at hand. weather in Tatras is unpredictable - Tatra mountains resemble the Alps and the climate here is harsh. The weather is temperamental and tends to change rapidly. If it had been sunny on all our trips to Tatra mountains, we would have hiked twice the trails.